Well well well, when you get into reworking something like I have done here with Kat’s complete topology it’s bound to take a little bit longer than expected. But here’s a quick update until I’m completely finished with her. Aiming on tomorrow, but you never know. 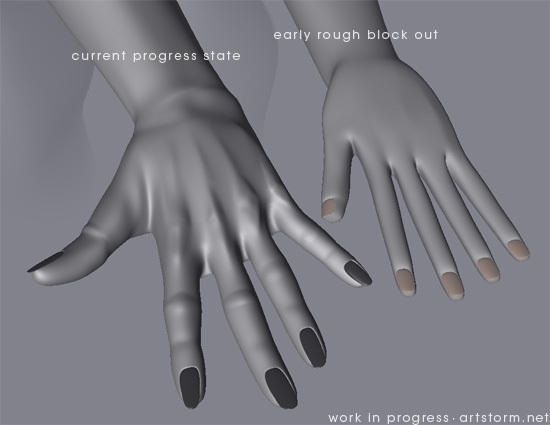 Anyway, here’s an OpenGL screenshot of her new hand in it’s current state compared to the old roughed out placeholder. It’s getting there, but I still some tweaking to do until I’m completely happy. Originally I intended this piece to be quite a quick one to improve my work with edgeloops. But since then I’ve got so much into anatomy and correct proportions so I’ve changed my mind and instead I am now aiming for this character to be my most detailed and realistic character yet to this date. Today I’ve been working on all parts of her body, adding details, especially on her back, adding all the small things like hints of the spine, shoulder blades and lot’s of small bones under the skin. I’ve most details in place but I have a few hours of pushing and pulling vertexes around until I get the nice smooth surface on top of everything that I want to have. I’ll post more images as soon as I am there.